My Girlfriend and I went to Ocean Shores (Washington) this summer. Check out the QuickTimeVR I did of this place. and suspect I was left there by a pod of dolphins (just kidding mom). Tieton River(?) 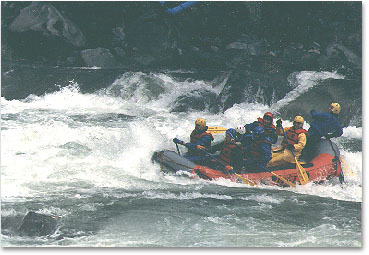 (Washington), My 1st year rafting was filled with new experiences. Terry fought to stay in the boat for this ride. These have the tendency to recirculate, so staying in is preferred. Just keep it straight and puuuush! This weir is no longer runable. My first solo guide through this stretch. 8 miles of rapids. The noise was always defining through this stretch. I'm taking them through facing forward (this time). Now it's like riding a bull, (the easy part). 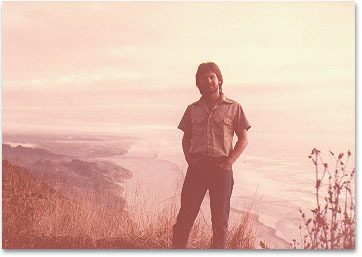 Me on Slide Rock, deep within the Rogue River Wilderness (Oregon). 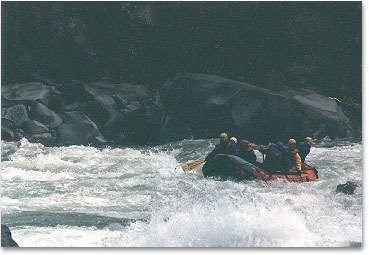 That was a week long rafting trip to remember. 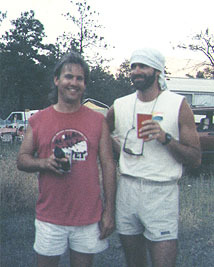 Mike and me after a day of rafting the Thompson River (Canada). Where the standing waves can easily be 30' tall (our rafts were 15' long). 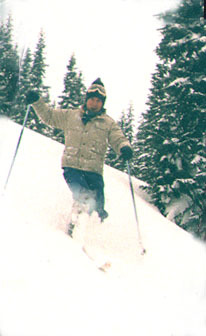 Skiing Stevens Pass (Washington). A rare blast of powder! Skiing Mt Hood (Oregon) in the summer. A real blast of sunburn. and someone else is wearing your outfit? Dan, me, Lane and Mike (in the 70's). We now call each other to coordinate our evening wear. both from our camp site on Goat Flats. The trail head is on the North Cascade Highway. Though quite a hike (12+ miles) it was worth it. 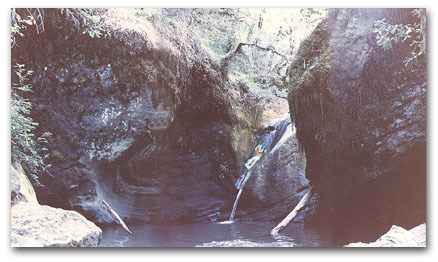 navigate to the hiking/camping sections. Use Goat Flats as the key word search. 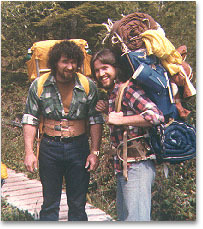 Hike difficulty is rated 4 out of 5, Coolness factor is an 8 out of 10. 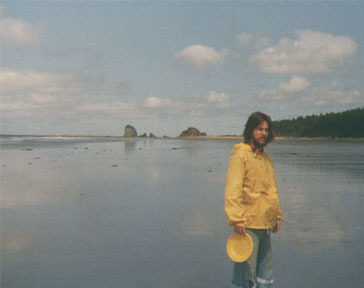 Me and Bill (some time ago) making the isolated 3 mile (board walk) trek from Lake Ozette to the Washington coast. Check out this QuicktimeVR I made from old hand held photos. This is about the extent on my sailing experience. My Grandfather, the Harley riding, barn storming, wing walker, was another big influence in my life. I see a direct parallel when I had my VW camper van and moped (well I can dream anyway). 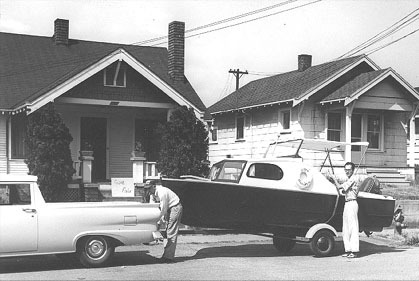 Grandpa and uncle Duane, with the boat he built. In front of our house on 8th Street in Bremerton. In the good ol days we loved to stage a grand entrance for the Trick Or Treaters. With a cast of thousands we manned fog machines, lighting effects, scary syntho sounds and masked assistants. There were years when kids were driven across town just to see us. leaving their little ones to fend for themselves I suppose. I can still see their little out stretched arms as they tried to stay as far away from me as possible, but they were determined to get the loot at any cost it would seem. The numbers of kids were so large we feared for our lives if we were ever to run out of candy, so I devised a survival tactic. I would snap the side of their sacks with my finger to simulate the sound of candy dropping in. They were usually so stunned by the spectacle they never took their eyes off mine. However the older kids were harder to fake out, sometimes I'd actually drop candy in one bag, snap the second while stealing some of their candy to drop into the 3rd bag.